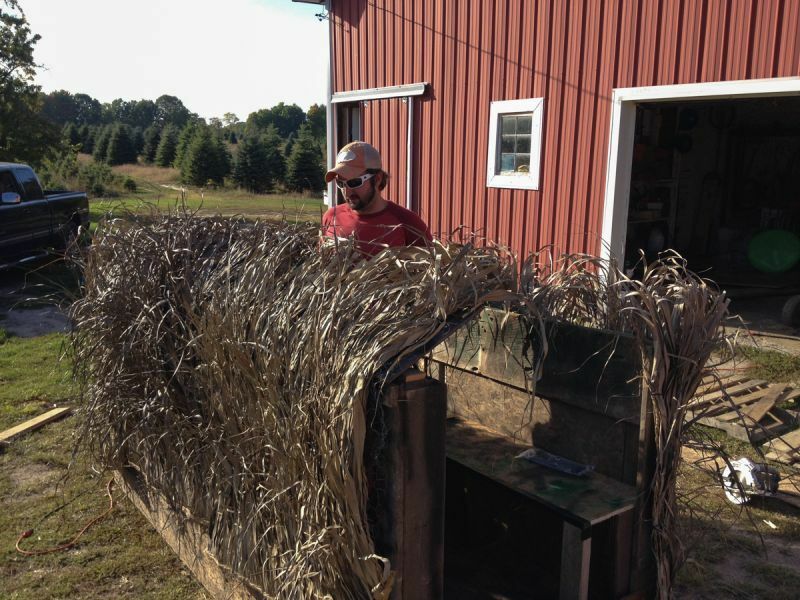 I am not a professional duck blind builder. I am not a "craftsman" although I am an ambitious DIY guy. I do not have endless money in the bank to build professional duck blinds and have them installed in my various waterfowl locations. 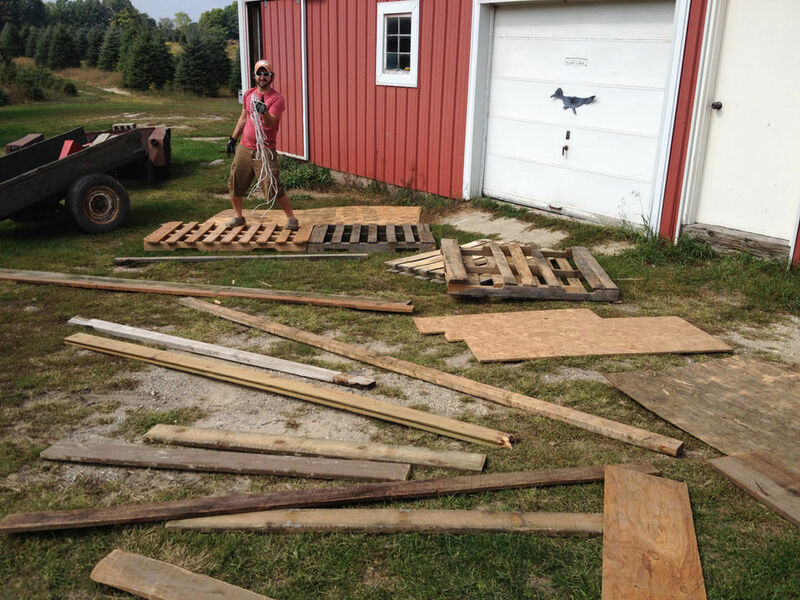 But what I do have is a pile of wood, a couple extra crates, and a desire to build a duck blind that is functional. 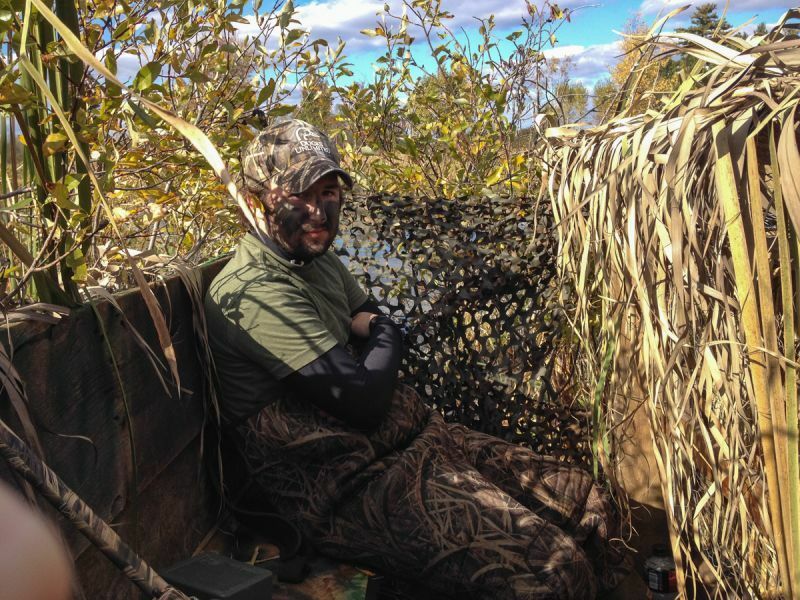 I want to have a better blind, better cover, and a better chance at shooting some ducks before they blow my cover. So this is a DIY guide to making something that works. The steps are very general. It will require you to improvise and make something that works for you. If you are a hunter, I trust that you can make something that is functional. 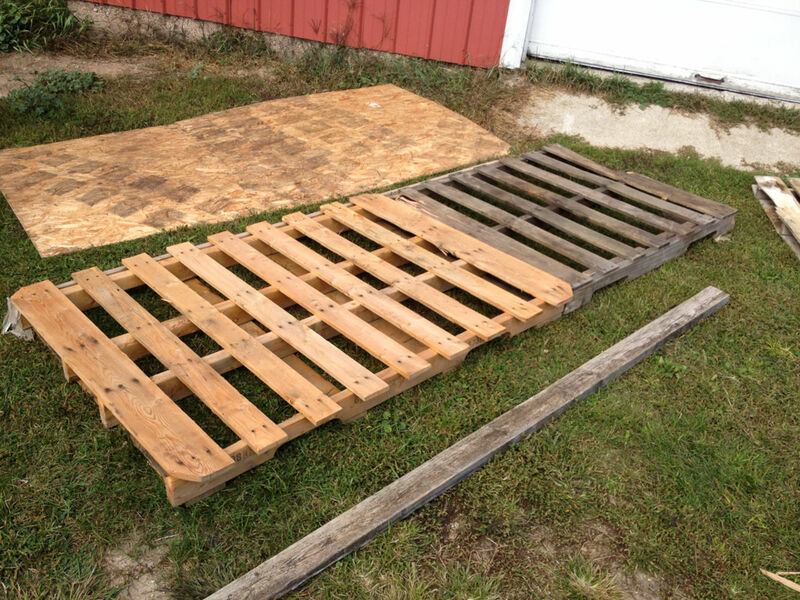 We put the two crates next to each other and took two of the longer 2x4's and screwed them to the outside of the crates. This created a fairly sturdy base that would keep the floor out of the water a little bit better. We took the 2x6's and cut them to an equal length for the back rest. 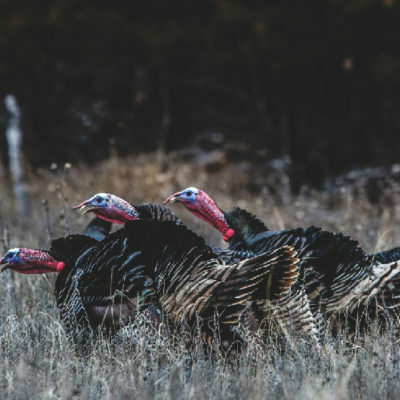 Cut them as high as you want the blind to be, depending on how much cover you are hunting in and how much room you want to shoot behind you. Screw on two of the 2x6's on each of the corners and one in the middle. We took a long 2x4 and screwed it across the 2x6's for the seat support. 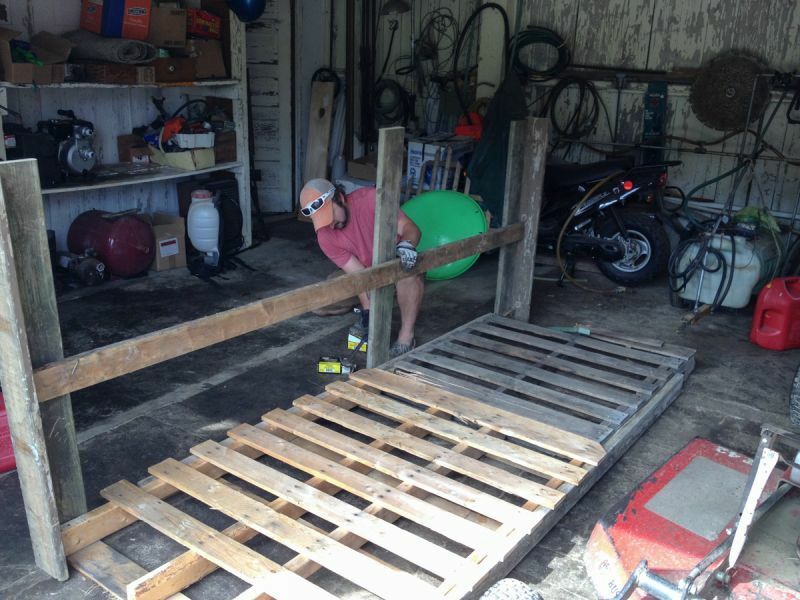 We cut the plywood to fit on top of the two crates and screwed it down to the crates. 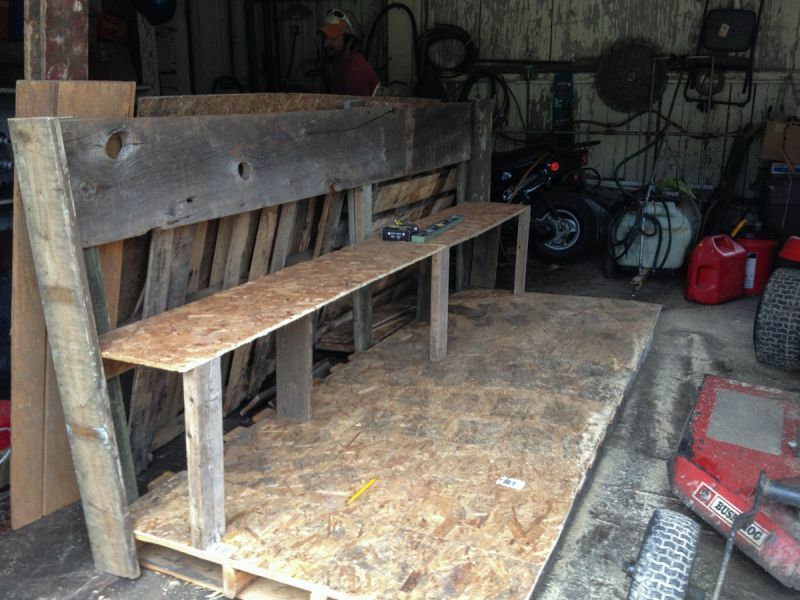 We then took two extra pieces of plywood and cut them to span the length of the duck blind for the seat. The plywood sits on top of the back brace and also on 3 supports that we cut for the front of the bench. Again, you'll have to eyeball the height for a proper sitting height. (One of our cuts wasn't the straightest so the supports leaned a bit..... again DIY, not professional). We also took a 2x12 and screwed it on as the backrest. Just as we built the back supports out of 2x6's, we did the same for the front supports. We also attached another 2x4 to span the 3 supports for stability. 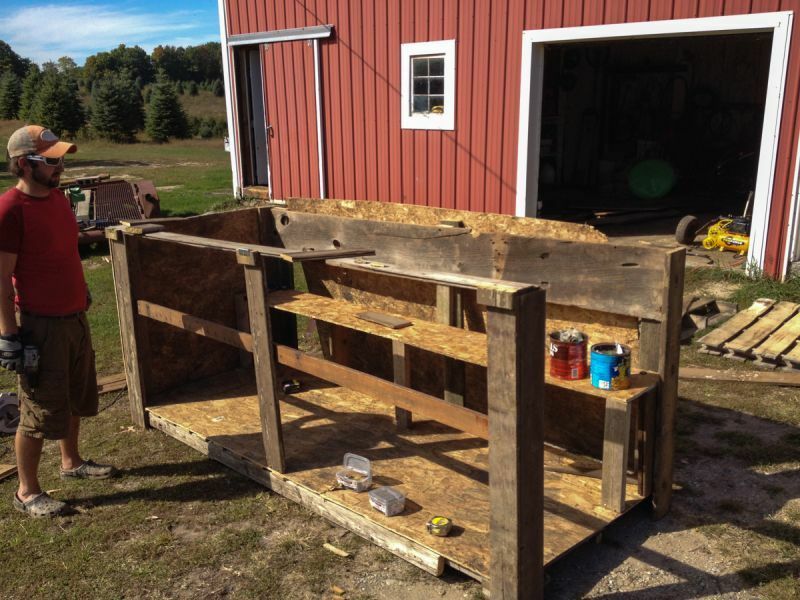 We put a 2x6 along the top of the 3 front posts which would be a rest for the swing-away shoot fence. We also fitted some more plywood to the back of the blind and on the far side of the duck blind. This provided stability. 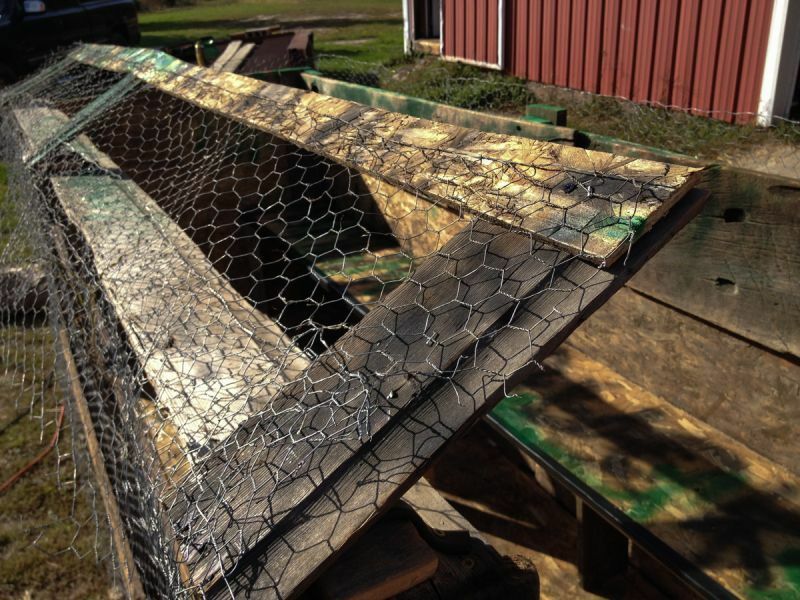 It's starting to look like a duck blind! We cut 3 little blocks and attached them to the front post. 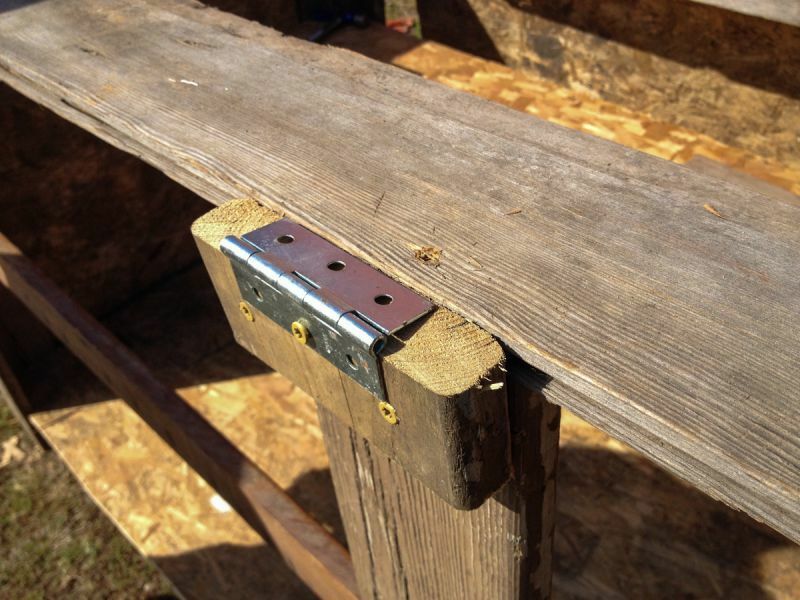 On the blocks, we put hinges that would be used for the swing-away fence. We cut 3 more equal size lengths of the 2x6's and screwed them onto the hinges. At the top of the 3 pieces we spanned a longer piece that helped stabilize the top. We added 3 more little blocks underneath the swing-away fence to keep the fence on an angle slanting up. 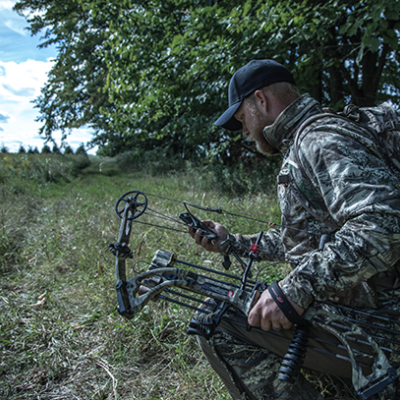 The fence swings away, but we actually shoot over the fence and use the swing-away action for making more space when getting in and out of the blind. 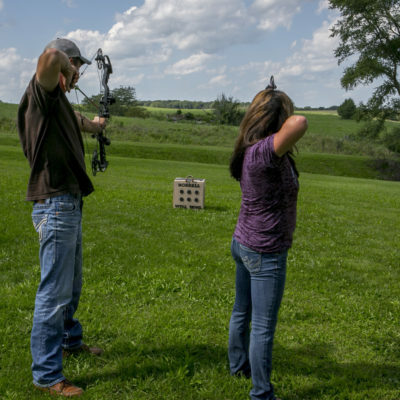 I'm sure you may actually want to use the swing-away fence for shooting, but for some people (like us), it can be another thing to mess with when you're trying to shoot ducks! Also, we wrapped the who blind in chicken wire and stapled it to the wood. It gives us something to thread all of the camo through. 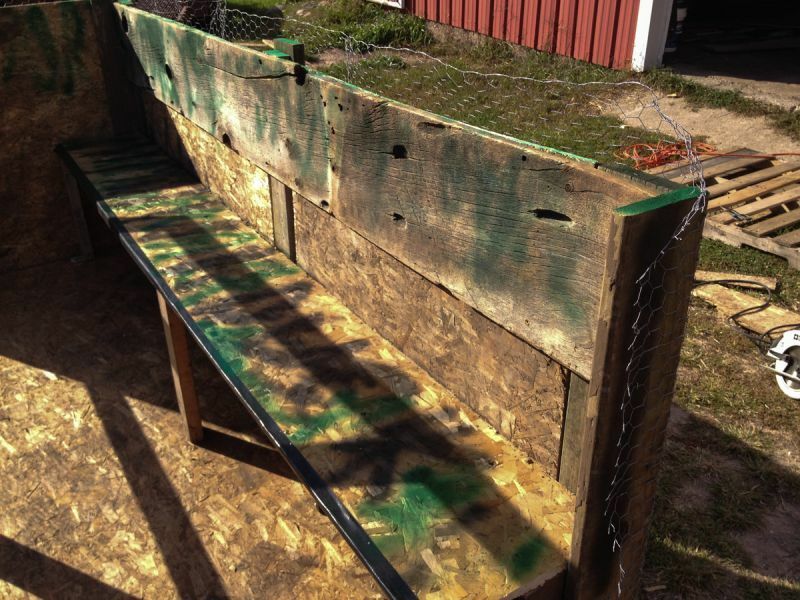 We took some spray paint and made the thing look more like a duck blind. We didn't have a ton, so it might be worth improving in the future. I also took some black electrical tape and taped up the end of the bench. I don't want plywood fragments cutting holes in my waders! 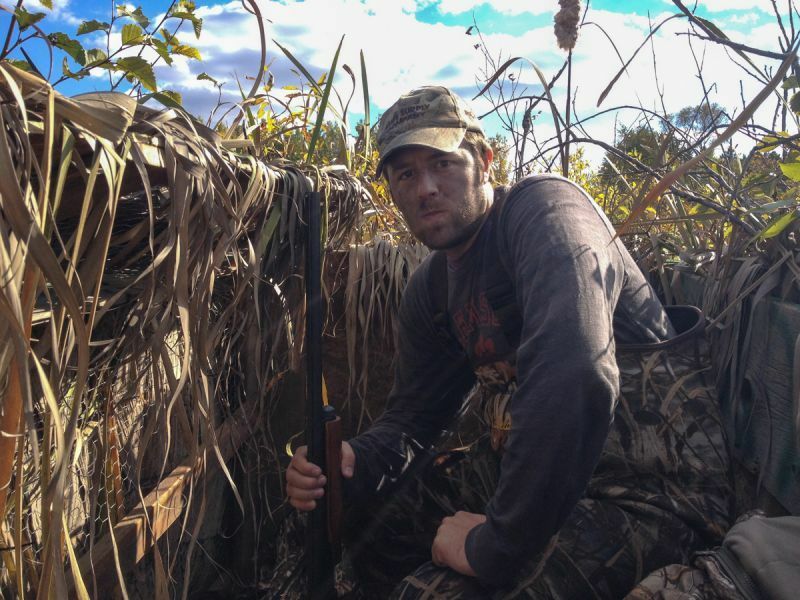 Josh (pictured below) bought some marsh grass from Gander Mountain. 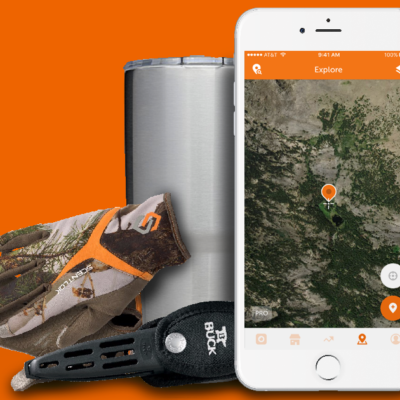 Here is the link: http://www.gandermountain.com/modperl/product/details.cgi?i=727614. This was a little cheaper than some of the more name-brand stuff, but hey it's duck blind camo. Ducks don't care. We zip-tied it to the chicken wire, and draped it over the shooting fence. We left some room on the bottom because the grass didn't reach all the way and we are able to fill in empty space with some brush from our hunting location. STEP #10 - Bring it to your spot and HUNT! This is the best step. I will warn you though, the finished product was pretty heavy. If I were to do it again, I would have built it closer to where it was going to end up. We had to put the thing in a boat and haul it out to the middle of a marsh. It was quite an experience, but hey, when you want something, you make it happen. Here's Josh below. The victorious hunters built their blind. It looks pretty good in the marsh. You can hardly see where it begins and ends! This is me - ready to shoot some quackers. This is Josh. Face-painted, and ready to hunt! 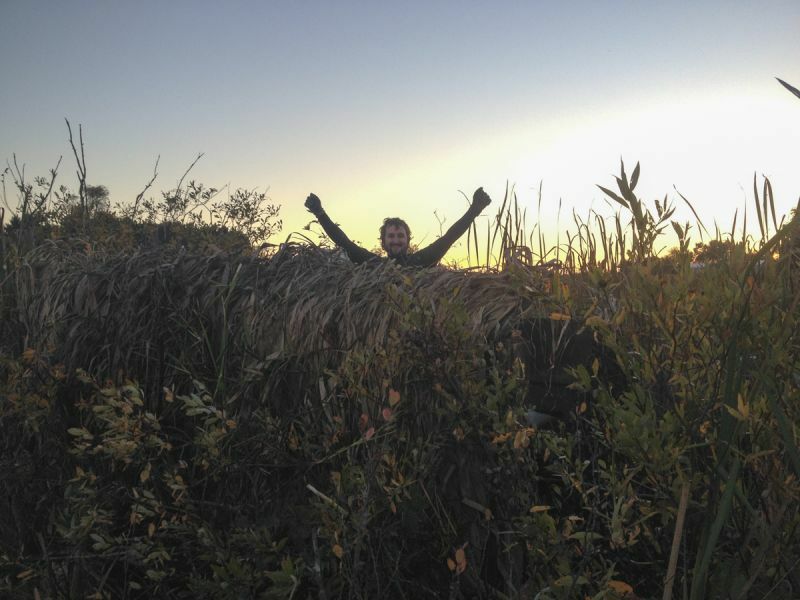 Good luck hunting and good luck with the duck blinds! 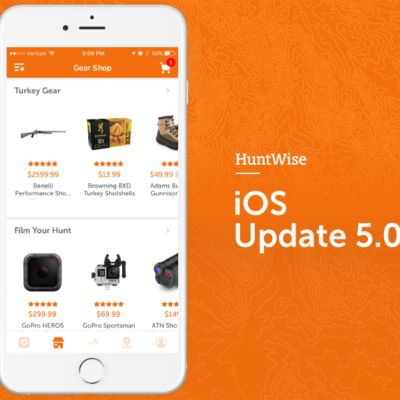 Download HuntWise and get private land ownership maps for all 50 states for only $49.99/year.